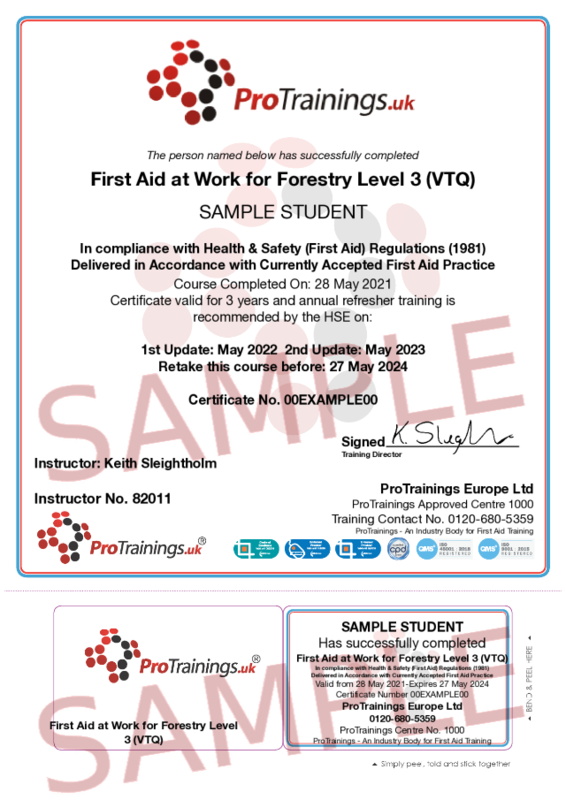 The Level 3 Forestry First Aid at Work Refresher FAW -F is ideal for most businesses whose risk assessment has identified that they require a fully trained first aider for their workplace and it is required to requalify in first aid after 3 years. This course is available as a ProTrainings CPD certified qualification, all courses are delivered, evaluated and quality assured to meet the new guidelines set out by the HSE in October 2013 and meet the requirements of the First Aid at Work (First Aid) regulations 1981. This version of the FAW-F course includes the extra subjects required by the Forestry Commission to include extra subjects covered include severe cuts like chainsaws, crush injuries, Hypothermia and Lyme Disease. This course is only for people who already hold a valid First Aid at Work certificate and they can take this 2 day course rather than the full 3 day FAW. You must have a copy of your original certificate. The Forestry Commission support the HSE recommendation that all first aiders undertake an annual first aid refresher and our course is designed to meet this recommendation. This course is ideal for all business types where the risk assessment requires a higher level of training as well as other area’s where a more comprehensive first aid course is required. The course must be at least 14 contact hours and run over a minimum of 2 day and the certificate is valid for 3 years. This course must be delivered as a 100% classroom course and cannot be delivered via online or blended training to comply with the HSE requirements.